Redland-based artist, Carolyn Dodds is an exceptional printmaker who has practised in the UK, Australia and America for over 40 years. For Dodds, her art practise is a way of life where she draws imagery directly from the world around her. Works showcased include pieces developed during her artist in residency at Capalaba Artspace earlier this year, a Redland Art Gallery project presented in partnership with Redland Libraries. 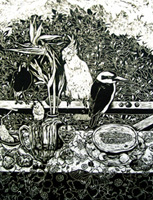 Image: Carolyn Dodds, Birds of paradise (detail) 2008, woodcut on Chinese rice paper. Courtesy of the artist.